In Soviet Russia, Half-Hour-Old Ferrari Fires You! 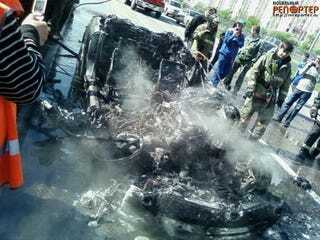 This Ferrari 612 Scaglietti was only 30 minutes old when its new Russian owner noticed things were getting a little hot around the collar, resulting in her watching this brand-spanking-new Italian stallion burn to the ground. The Ferrari 612 Scaglietti normally would run you $320k, but in Russian it ran its new owner almost $850k, making this Italian campfire even more gut wrenching. I owned Ferrari for 30 minutes. Just bought it for 600,000 EUR and was heading home, when I noticed some smoke coming out from under the hood, I promptly pulled to the sideway and ran out of the car. Just in minutes all my new Ferrari was caught on fire. I really don't know what has happened.